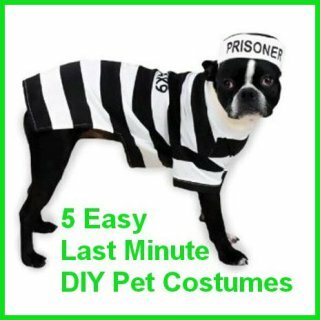 Need a cute pet costume before Halloween, but don't have much time left? Here are some adorable DIY pet costumes to inspire you! All you need is some stuff you have laying around your house and possibly a trip to your local dollar store and you can have an adorable costume for your pet in no time. This creepy costume can be completed in a few simple steps. Large rolls of cotton gauze or bandages. 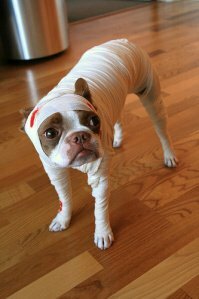 Simply wrap the bandages or cotton gauze around your pet's head, torso, and legs. Remember to leave open space around your pet's face and private areas. Complete the look by applying a little fake blood on various parts of the gauze, keeping it away from your pet's face and eyes. 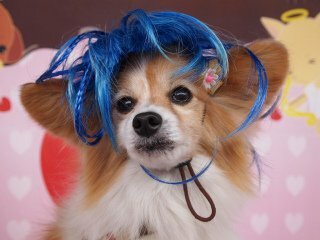 Make a cute and silly costume for your pet by crafting a festive Halloween wig for the holiday. Needle and thread, or glue. Begin by cutting the felt in an oval pattern in accordance to the size of your pets head. Measure between and around the ears to determine where and how large to cut the ear holes. This will be your wig base. Lay the base over your felting brush or pad and place 1/2 inch of the wool at the edge of the base. Use the felting needles to attach it, and continue until strands appear at the underside of the base. Continue this process 1/4 inch at a time, felting around the base. To cover the felted edge, fold locks up and away from the holes. For the center part of the wig, felt the wool from the ear holes into the center. To hide the felted area, fold the wool strands over the felted edge and back toward the ear hole. To make sure the wig stays on, you can attach two felt straps to either side and tie them together, or attach them with Velcro straps. 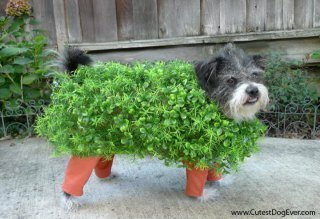 Want to change your pet into one of these fun and infamous growing plants? It's so easy to give this costume a try! Start by measuring your pet from the front of his chest to the end of his body to get the length. For the width, measure from the bottom of your pets stomach to the top of his back and multiply by two, leaving a little extra room for movement. Cut the correct measurements from the felt and lay it over your pet. Mark the neck area, take the felt off, and cut a hole for his head. Cut holes throughout the felt with an exacto knife and push the prongs of the aquarium plants through the holes (you may have to pull them off a grid first). Next, line the bottom of the costume with felt so none of the prongs will poke or itch your pet. Hand stitch aquarium leaves around his neck and collar to complete the look. Optionally, you can create some Terra-Cotta colored cotton legs to create the look of a potted plant. Inspired from The Flirty Blog. 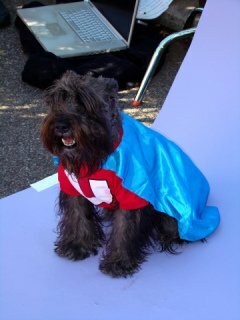 This extraordinarily easy costume can make you pup look like a superhero. Red child-sized t-shirt (varying with the size of your dog). Fabric glue or iron-on hem tape. Begin by cutting the signature Underdog U into the white felt. It should be fairly large, enough to cover the center of the shirt. Attach the felt with fabric glue or hem tape. You can also sew it on if you feel so inclined. Sew Velcro onto the neck of the cape to hold it in place, and make sure there aren't any rough edges on the fabric. Attach the cape with the Velcro, and your costume is complete. 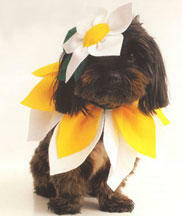 This easy costume consists of an adorable flower collar and an optional daisy hat. It's a ridiculously easy last minute DIY costume that is well worth the minimal effort. Felt: white and the color of your choice. Start by cutting out the petals. Half of them should be white, and the other half colored. Make the colored ones a little smaller than the white ones, and adjust the size according to the size of your pup. Next, sew each petal into the collar. White petals should be on the bottom, and yellow petals should be on the top. Just like that, you have a flower dog! Optionally, you can create a daisy hat with some yellow felt for the center, and small white felt petals. Sew some Velcro straps to the center of the flower, hidden from sight, to hold it onto your pup's head. With one of these 5 costumes, you'll have an adorable, easy to make costume for your pet to wear this Halloween. So, get to it, and have fun! Article originally published September 2012 and updated October 2015. What Is Standing Over This Guy's Head? The Animal Video Of The Day!! !